It's Facebook Fridays! for April 1, 2016! This is the week for you to gain a crucial edge in games of chance! 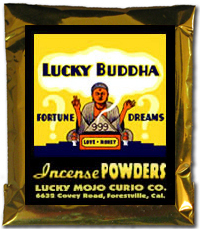 The Lucky Mojo Curio Company is holding a random drawing to give away 10 traditional Lucky Buddha prizes to bring good times and good fortune! 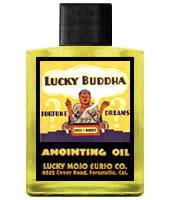 This week 5 lucky winners will each get bottles of hand-made Lucky Mojo brand Lucky Buddha Dressing Oil, 3 will receive a packet of Lucky Buddha Sachet Powders, and 2 more will win a packet of Lucky Buddha Incense Powders. First thing tomorrow morning, we will select TEN winners at random, and ask them to message this Facebook Page with their mailing addresses, so we can send them their FREE Lucky Buddha products. Thank you for posting this, Ernie. Hey, Forum Folks -- it's time to get over to Facebook and enter the weekly contest! Don't miss it! We have a winner! In fact, we have 10 lucky winners! Our Facebook Fridays! winners for April 1, 2016 are: Patricia Boutilier, Sarah Pietras, Tracy Corbin, James Cardinal, Latoya Kelly-Adams, Matt Whealton, Shannon Tinsley, Alma Gunn, Gretchen Whelan, and Simone Szeto.